Diuretics are often prescribed for a range of different illnesses. There are however a variety of plants and herbs that contain more natural diuretic properties. This article will take a look at some of the most effective. I am sure that you have often heard of the diuretic properties of various herbs and beverages but what exactly is a diuretic and how do diuretics work? A diuretic is a type of remedy used to increase the secretion of urine and its elimination. They can be used to help your body to rid itself of excess fluids, mostly made up of sodium and water. Most diuretics help the kidneys excrete larger amounts of sodium into your urine. When these diuretics help to flush the sodium out of the system, they also flush away the water. Diuretics are often prescribed to treat edema especially in people with liver, kidney and heart conditions. They are also used to treat hypertension or high blood pressure and sometimes for glaucoma. 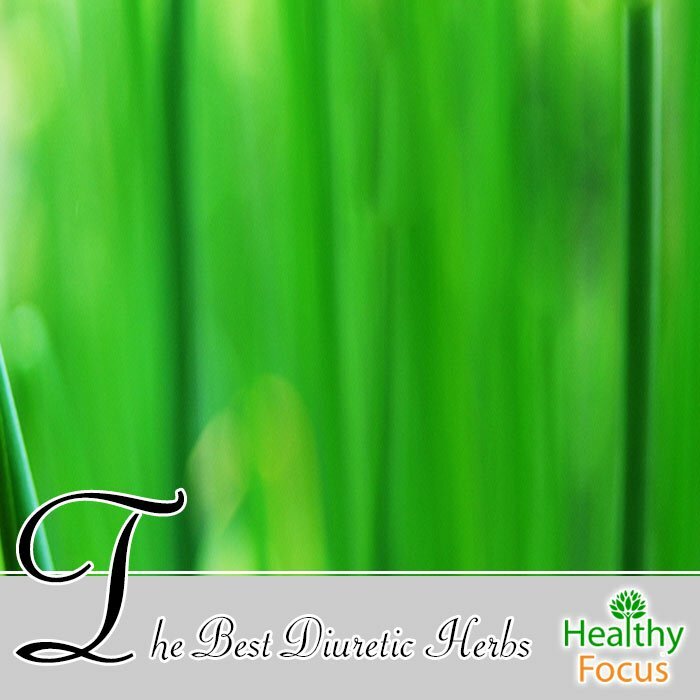 When it comes to herbal medicine, the term diuretic is often used broadly to refer to an herb that has a beneficial effect on the body’s urinary system. As is the case with many prescription medications, diuretic drugs can cause certain unwanted side effects. These may include muscle cramp, fatigue, headaches, rashes and dizziness. Fortunately, there are a number of more natural herbal remedies that have diuretic properties and could help you to flush out the excess fluids and sodium from the body. They can help you to detoxify your body and keep your organs in effective working order. Of course many of the illnesses that require diuretic medications are extremely serious and it is important to consult your doctor if you are in any way concerned. You should also speak to your doctor before taking any herbal supplements with diuretic actions. While most herbs are generally regarded as safe, they are not without risks. They may cause allergic reaction or interact with medication that you are taking. According to research published in 2001, as many as 85 plant species are known to possess natural diuretic actions. (1) Many herbs can be taken in the form of a tea and will have a similar effect to the water pills available at your pharmacy with fewer side effects. The following list is not exhaustive but represents some of the best natural diuretic treatments according to scientific research and traditional use and availability. Often regarded as an unsightly weed and discarded by gardeners around the world, dandelion has a ling history of traditional uses for a variety of medical complaints. It has been used to treat digestive issues, liver and gallbladder complaints and research shows that it can also be used as a natural diuretic. For a full review of the benefits of dandelion and advice on preparation and dosage, click this link. Horsetail is another nonflowering weed which has long been used for its medicinal properties. Horsetail which is a close relative of the fern has also been used as a natural diuretic and recent studies have demonstrated that its diuretic effects are real. While the study used an extract of the herb, horsetail can also be taken in the form of a tea. The use of hawthorn berries in medicine dates back many centuries. Esteemed herbalists like Culpeper wrote about their natural diuretic effects and recommended the berries to help treat bladder complaints and kidney stones. Today, hawthorn berries are often used to treat heart conditions like angina and congestive heart disease. Unlike the vast majority of herbal teas which are caffeine free, both black and green tea contain caffeine. There is a common belief that beverages which contain caffeine have a diuretic type effect. However, this conclusion may stem from studies in which subjects were treated with a large amount of caffeine. While green and black tea may have some mild diuretic effects, one review published back in 2006 suggested that consuming caffeine from tea would not cause a significant diuretic effect unless you consumed over 300 mgs of caffeine at the same time. This represents around 6 or 7 cups of tea in one sitting. Uva ursi also known as bearberry is a small plant with red berries. The leaves of the plant are often used as an ingredient in preparations to treat edema and inflammation. According to experts, uva ursi does have diuretic effects but they are relatively mild. The leaves contain hydroquinone and arbutin as well as tannins that can help reduce swelling related to water retention. The plant has been used for centuries to help treat bladder, kidney and prostate complaints. It is still recommended by herbalists today to help relieve bladder swelling caused by a urinary tract infection. However, the authors of the study also warned against taking the herb in high doses because of potential adverse effects. Marshmallow root which you can consume as a tea or in various other supplementary forms also appears to have diuretic actions. According to experts, the herb can be used as an alternative to prescription water pills to help treat conditions like edema and bloating caused by water retention. Hibiscus has a variety of excellent health benefits and can be made into a thirst quenching tea which is absolutely delicious whether drunk hot or cold. It is notable for its ability to reduce blood pressure naturally but according to studies, also has natural diuretic effects. Many of the illnesses for which diuretic medications are prescribed by doctors are extremely serious and in some cases, life threatening. Herbal diuretics are not to be considered a substitute for diuretic medication prescribed for serious illnesses. The majority of herbs with mild diuretic effects are unlikely to have any serious side effects especially of they are taken in the recommended doses. Make sure that you consult your doctor before taking a herbal diuretic especially if you are already taking a prescription drug to ensure there is no interaction.